If you have imbalances or deficiencies in everyday basic rotational movements, they only become more compounded and exposed during high demand physical activity. Introducing Rotational Movement Training® and rotational exercises to your workout will minimize deficiencies and maximize power. 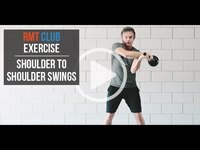 The videos above will take you through a variety of rotational exercises, including using ipsilateral training, “coiling core," to engage lats, core, and athletic balance, as well as training with swinging modalities (clubs, ropes) to improve rotational movement and integrate the body.